plug-and-play, silent, fume-free generator for emergencies, camping, or wherever you need power. The Goal Zero Yeti 150 Solar Generator is a gas-free source of portable power to keep lights, phones and laptops powered on through any situation. 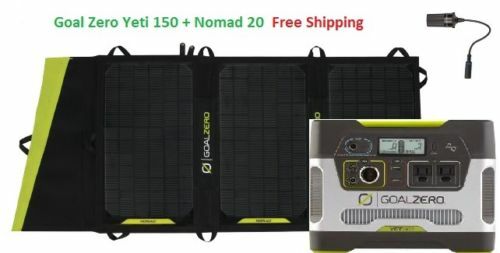 By pairing the heavy duty performance of the Goal Zero Yeti 150 Power Pack with the efficiency of the Nomad 20 Foldable Solar Panel, the Goal Zero Yeti 150 Solar Generator Kit creates a match made in heaven and offers adventurers and preppers a great alternative source of power for their electronic devices. GOAL ZERO YETI 150 SOLAR GENERATOR have proven to be so versatile, useful and light weight. Yeti 150 and Nomad 20 solar panel is a great combination. You recharge my laptop, ipad, phone and Goal Zero lantern- efficient and help the planet a bit. The Goal Zero Yeti 150 Solar Generator is a savior in a small, portable package. This mini-powerhouse saves the day during an outage or saves your outdoor or camping party from being a total bore. Wherever you need power, this baby brings it. With USB, 12V, and AC connections, you have plentiful options for use. Juice up your laptop, tablet, camera, or phone for lights, music, entertainment, or if you just need to see what the hell it is you’re making for dinner. The Sun: The Goal Zero Yeti 150 can be charged by connecting a compatible solar panel (see the chart below for solar compatibility). Wall: The Goal Zero Yeti 150 can be charged by being plugged into a regular wall outlet. Car: The Goal Zero Yeti 150 can also be charged by plugging into your car 12V adapter. USB: The USB port best charges all your medium size USB powered devices. 12V: The 12V best charges all your medium 12V powered devices. AC Inverter: Plug in your device just as you would the wall. FEATURES Solar Capacity: 20W Power Output: USB Ideal for: Sherpa 50/100, Yeti 150/400 Weight: 2.5 lbs (1.1 kg) Chainable: Yes Cell Type: Monocrystalline Our largest foldable panel ensures you’re collecting the most power from the sun for your gear. Utilize the built-in USB port or pair with a Goal Zero portable power pack to charge your gear day or night. WILL GOAL ZERO YETI 150 SOLAR GENERATOR KIT RUNS A CB RADIO? Question: Yeti 150 can be taken on a plane? Answer: You sure can. The Yeti 150 unit contains an advanced, sealed lead-acid battery that is completely safe to bring along on your flight. Keep your manula while you were travelling and can show them if asked. Question: How do one know if my Yeti 150 is charged? Answer: To check the charge level of the Yeti 150, check the manual on the LCD Battery Display. When lit up, you’ll see a battery outline with 5 segments, indicating the current charge level. You can turn on the Battery Display by pushing one of the power buttons above each output port. It is absolutly OK to use your Yeti 150 even when it’s not fully charged. Question: Can replace the Yeti 150 Battery? Answer: Yes Absolutely. Your Yeti 150 depends on an advanced lead-acid battery to power your gear, and like all other batteries, one day it will make the journey to the battery graveyard. Lucky for you, the Yeti 150’s battery is replaceable. Question: My Yeti 150 is beeping, what does that mean? Answer: Plug your Yeti 150 into a power source, like a solar panel or outlet, as soon as possible. This chirping is to alert you that your Yeti 150’s battery is low and needs to be charged. Question What type of battery is in the Yeti 150? *AGM batteries last longer if you do not drain them completely. This stems from the “battery memory myth” in old rechargeable batteries.